Introduction: This is a strenuous walk but one which is mostly an easy to route find, providing you have good visibility. Gaiters are recommended for the descent which can be boggy in places. To fully cover the route at 1:25000, you need the two OS maps listed above. Start: The walk starts in the main car-park at Ambleside, opposite The Armitt Museum (NY 376047). To use this car park, you may need a second mortgage and a plentiful supply of pound coins! It is a waste of time trying to economise by trying to find free parking in the town. There is none - the Council have things sewn up. 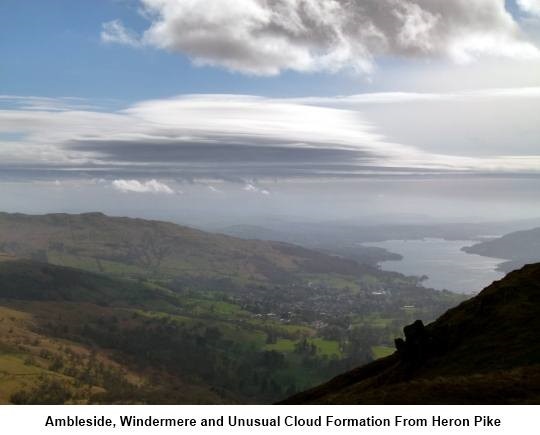 Ambleside is on the A591 between Kendal and Keswick. The exorbitant car park is on A591 at the north west edge of the town. To begin the walk, turn left out of the car park and walk along the A591 for about 1/3 of a mile. 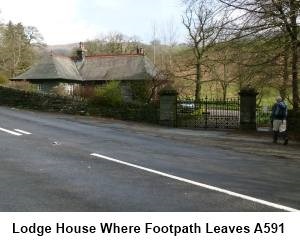 Shortly after you pass the national speed limit sign, look out on the right for a bungalow/lodgehouse behind some substantial stone gateposts with iron gates (NY 372052). There is a fingerpost here indicating Public Footpath to Rydal Hall but it is not easy to spot and probably disappears into the shrubbery in spring/summer. Go through the small gate and follow the track alongside the brook. After a few hundred yards, the track swings away from the brook. Stay on the track going through the gate (or over stile) into the grounds of Rydale Hall. Turn right at the finger post for Nab Scar. Go left through the Rydal Hall buildings and over the bridge following the Grasmere/Rydal Mount signs. On arriving at the metalled lane (NY 365064), turn right signposted Nab Scar. The lane climbs and past the bus turning point, turn right along a concreted track. As this track curves left, carry straight on through the kissing gate heading for the fell (NY 364065). Beyond the kissing gate the path has been well “manicured” with stone steps. The path passes between two walls and leads to a ladder stile. Beyond this you come out on to the fell proper. The walk is now something of a relentless climb for the next 3.5 miles along the ridge to the summit of Fairfield, passing over Nab Scar (NY 360068), Heron Pike (NY 356083) and Great Rigg (NY 356105). Just keep climbing and ignore any tracks which lead off the ridge top. 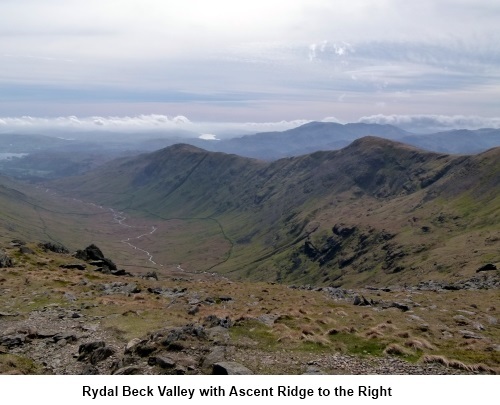 There are good views of the Langdale Pikes and the major Lake district fells to the west, as well as down to Rydal Water and Grasmere. The arrival at the summit (NY 358117) is something of an anticlimax. There is no trig point or summit cairn of note (only a very small cairn). You are faced with a flat stony top and some crude attempts at shelters. 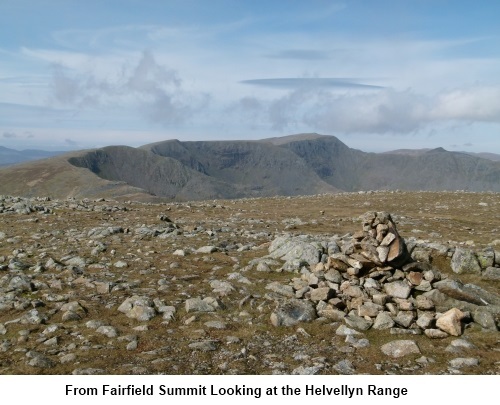 The bonus however is a fantastic view of Dollywaggon Pike, Nethermost Pike and Helvellyn with the contours of Striding Edge clearly visible. It is worth wandering to the north west edge of the Fairfield plateau for the best views but do not descend too far. The walk now continues across Fairfield across the head of the Rydal Beck valley. If you are lucky, you might see clouds forming from no-where as the winds sweep up and over the edge. The path is in an easterly direction first then south east towards Hart Crag. This is potentially where you could go wrong so concentrate! 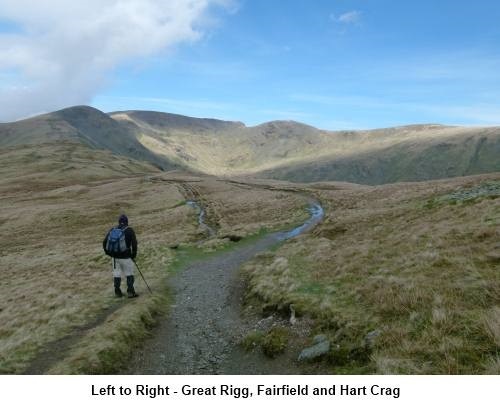 You make the descent from the Fairfield plateau then climb Hart Crag. 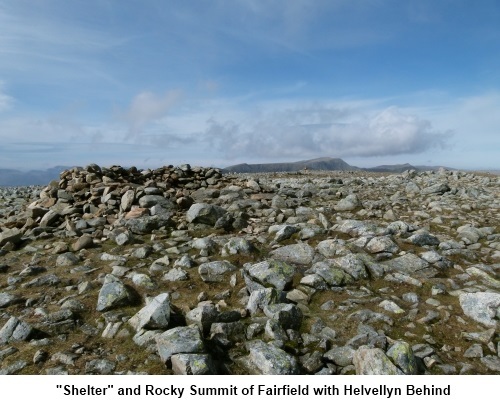 At the top of Hart Crag (NY 3681143), the path levels out and there is a large stone cairn (pile of stones). The obvious path begins to descend from the cairn but you do not want this as it leads to Hartsop above How and ultimately to Patterdale. From the cairn, you need to bear right. The path is not east to see because of the stony ground. The compass bearing from the cairn is 140 degrees (discounting adjustments for magnetic variation). 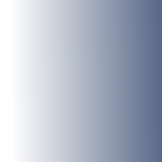 The path soon becomes clearer. The descent from Hart Crag is rocky and a little tricky but you just need to watch where you put your feet. The path soon starts to run alongside a stone wall, at first collapsed but later more complete. This wall is your guiding hand virtually all the way back to Ambleside. The OS map shows the main footpath route changing to the right (west) of the wall but I found it easier to stick to the left side – a dotted path is shown on the OS map. You cross High Pike (NY 374088) and Low Pike (NY 374078). Other than where the terrain forces minor detours, stick to the wall all the way down. It runs out at a wooded valley overlooking Scandale Beck (NY 376057). Turn right through the gate and follow the track down into Ambleside. It becomes a metalled road which brings you out opposite the car park where you started.